The main reason for why I do not want this to be my job is that I see so many bloggers comment things like "oh well I need to pay a bill" or something along those lines. HELL NO. Having to worry like that over possibly not getting opportunities you need to live? I would hate to be in a position where I feel like I am writing about something I don't really care about, or don't really love, because I have a electricity bill to pay. I mean I get it, we all have these bills to pay, but to me I read blogs for honest reviews on products... is a review truly honest if you are being paid to promote it? I think you can give a very honest review, but if I have a bill looming and I know I need the money to pay it... I would doubt even myself if something is average and I am saying its AWESOME. I don't want to be in that position. 2. The Media & Saying NO. From what I have gathered as time goes on the more and more emails you will begin to receive from PR agents wanting to send you all sorts of things, I mean great, awesome, but I didn't start doing this for that... I did it because I love it, not to get free stuff.. and I really don't want to just be using PR samples in my posts, doing posts on releases rather than things I have gone out and bought. That is why I reject and say no. I want to keep my blog things I would use anyway, keep it me, things I am obsessing over without being sent... I'm not saying I don't use item which have been sent to me, but I want to keep it real. I have seen a lot of posts with people being overwhelmed by their emails, my response is always "set up an auto response, and say you are taking time out to breath - post what you want and love your blog for a few weeks." Maybe I am being totally clueless here. Such a simple statement. But I see so many people panicking over posting something different, or not posting for a week, or just not enjoying it anymore. It's your blog. You can post whatever the hell you want on it, people can choose to read it. Hell my next post might be on my favourite cat pictures for all you know... the point is you can do what you want - when you want with a blog. No restrictions. You don't owe anyone anything, and your readers would understand if you took time out, or wanted to post something different. Don't let your own restrictions control you. And if you got to a point you truly hated it - you can shut it down. You can stop. Sounds silly, but I want a job. One I love, one I cannot wait to go to. This year I will be applying to midwifery. And I so hope I get in, and if I don't get in this year, ill be applying again next year. I want a job that I will love until I am 70. And I can't see me at 70 blogging? I have a job at the moment, but I don't love it, but I am not away to stop. Omg my head hurts just thinking about it. I just cannot bare the thought of having to do accounting and tax returns.. nooooo. just no. 6. Having a Hobby you Love & Enjoy. I LOVE blogging. LOVE it. I love the networking, I love the chats, I love reading other people's blogs. I love beauty. I love talking about it. But most of all I love how I don't HAVE to do any of it. If I wanted to I could stop right now. But I don't because I enjoy it. The minute it becomes a job, you have to do things.. and to me that just removes the fun aspect. 7. Control and Keeping it Me. Such an odd thing, but I love how I control all aspects of my blog. I write what I want, say what I want. And if I don't want to post I don't. I also love how it is a true representation of me. My heart and soul is in this blog, it is everything I love about beauty, everything I am obsessing over. I get to post about candles, or jeffree star, anything that pops into my head really.. and I don't know if I could keep it this genuine if I was trying to support myself and my family through it.. Although I don't want to be a full time blogger I still have goals for my blog. I really want to hit 1k on bloglovin' and grow my social media channels, but I see them as things like fitness goals, you want to achieve them for your own enjoyment, something to work towards. My true goal for my blog is for me to be happy. To grow friendships and relationships, to improve my writing style and be less like a rambling loony.. I just want it to be something that's a "oh and I have a blog" Not let it be who I am. I agree with all the points you mentioned here.. I enjoy blogging at my own pace and not because I'm forced to blog.. Or else my posts won't feel sincere at all! I have never thought about why I wouldn't want to be a full time blogger, but these points say it all. Great post! Such an honest post! I haven't been blogging long, but I love it! I love it as a hobby, I wouldn't want that to turn into my job! Don't get me wrong, blogging is like a part time job the amount of time I am spending on it, but I wouldn't have it any other way!! Great post, this was such an interesting read. As much as i love blogging i wouldn't want a career that's home base. I definitely want to work in the beauty industry and blog on the side. These are some really good points! 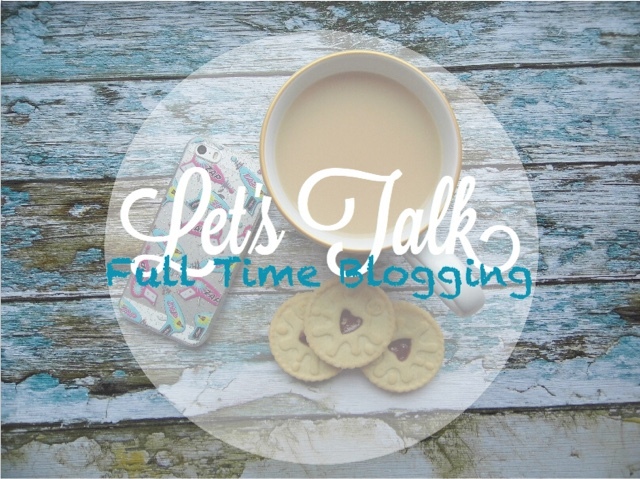 My goal is to blog full time but the instability of it is something that worries me. I think having a part time job to guarantee me some income might be the best way to go should I ever be lucky enough to make some decent money blogging. Great post! Love this post, I do blogging as a hobby and would never want that to change - living in a house with a self employed parent (my dad is a photographer) I see how stressful it can be on an everyday basis so I'd never want to do it myself! Fab post, lovely! Some solid reasoning which I couldn't agree more with. I say no A LOT because I only want to feature something I am truly passionate about on my blog. Just over a week ago I got an email from this PR guy offering me insane amount of money for a sponsored post (honestly, I was like O.o) BUT the catch was to include a follow link which basically means my Google rating and "searchability" would go downhill big time (someone with 1 follower could rank better). When I refused he offered me more haha. I said no again. I completely agree! (And I for one would love to see a post about cat pictures, no shame) I feel like once you turn a hobby into a job it becomes work and you may not enjoy it anymore. For me personally if I make money off my blog I feel happy investing it back into the blog with new props, maybe a camera, etc. I agree! I've only been blogging 6mnths and its just a hobby for me which I enjoy very much. But if I did this full-time, I think it would take the enjoyment away from it. As for the freebies! I honestly couldn't care less about them. I don't get many and I prefer creating my own material. Not the PR! These are all great points with which I agree, especially Nr. 3. For me, I would like to make some passive income on my blog but not be full time because there are so many other aspects to my life. I don't want to be lugging along a DSLR and a lens to a restaurant and cafe just to take photos. When I blog about restaurants, I just use my phone. I also wouldn't want to be famous, because with fame comes haters, and I am pretty sensitive when it comes to other people's comments. However, some people have been able to be rich off of it, so I don't know. I'm torn. I agree so much with this post, you've made really great points! I don't mind any extra income coming in from my blog (extra pennies for stuff to beautify myself with!) but I don't think it's something I could ever do as a standalone source of income. I love blogging, it's fun and definitely something I see as a hobby. But I learnt when I tried to make music a career I began to hate it and stopped doing it, so I would never want that with another hobby! I'm totally the same, I love blogging but I love it because it's a hobby! I'd find it way too stressful to work alone and never be sure where the next bit of income is coming! Love this post. It raises some really valid points that if I'm honest is not considered; the integrity of a post if you have a bill to pay. I couldn't go self employed as my other half is and we need the reliability of my wage just in case. I also think I'd lose some of the enjoyment if I HAD to blog. There are some great thoughts here. I'm working towards being self employed one day, but not in blogging, blogging is something I do for fun along side my career, and as a marketing tool. Thanks for sharing this post, you have a lovely blog! I agree with you. I do this as a hobby and that is why I love it so much. If I did this as a real full time job, there would be times that I would force myself to sit down and write and I would hate this. It is normal when we sometimes don't have time or we are bored to do it; if it was full time, it would be too stressful for me and I know myself, I would quit. To be honest, I would not mind making money out of my blog and turning it into a career, but I wouldn't want it to be my only income source/only job. I would like to think that one day y blog would lead me onto a lucrative career and various income sources.